The 2013 Fantasy Faire has officially kicked off and there is no shortage of fantasy fashions, items, poses, accessories and landscapes on the grid today! This unbelievable effort of combined talents has given us not one, but 10 virtual showrooms to gather the coolest, most up-to-date fantasy creations we can get our mystical hands on… all the while supporting the American Cancer Society’s vision of a world without cancer! This event really touches my heart. I lost my beautiful brother, David, to lung cancer. I cannot even begin to describe how this horrible disease changed my life, but I can tell you that I feel as though part of my soul was ripped out the day David died. So I am posting my Fantasy Faire images in honor of my brother David. My smile. My heart. And my soul. Namaste. 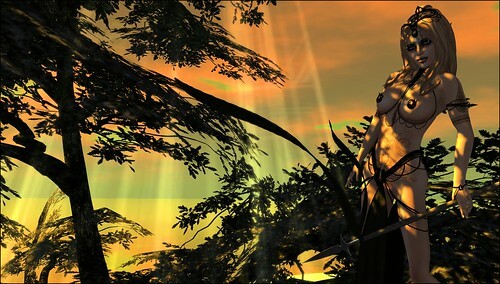 They may not have been created by the most talented photographer in Second Life…. but they have been created with a love so strong and pure…. they could only send out waves of positive energy to those who need it most. I am kicking off the event with one of the Feature Creators of Fantasy Faire, F*cking Ninjas! These mad girls have been burning the midnight oil for the last few weeks conjuring up exclusive poses for this event and I can tell you without hesitation they are phenomenal! The above pose, Welcome to the Jungle, comes with the spear prop and is just one of the many exclusive poses I plan to share this week. So head over to Ravenshard, jump on the book shelves and check out their Ninja skills! The Facial Piercings in the above image are from designer Pheobe. The piercings are available until Suday at Acid Lily Gallery for 50L!!! The detail on the piercings is incredible and the hud not only lets you choose metals and gems but also allows you to add shadows for a more realistic look! They rock!